No matter where you live in the United States, a Native American got there first. We’ve come a long way since the days of Tonto and the Lone Ranger, but many of us still know very little about the people who first settled – and still live – in our communities. Contrary to the Hollywood cliches, there were many different tribes of Native Americans, each with unique cultures and ways of life. Exploring them is a great way to learn more about our country’s history. Sustainable farming is all the rage these days, but it’s nothing new. The “three sisters” – corn, squash, and beans – grown by Eastern Woodlands tribes saved the Pilgrims from starvation and provided an early lesson in environmentally friendly farming. The corn provided stalks up which the beans could grow; the beans added nourishing nitrogen to the soil; the squash spread out and prevented weeds from horning in. Planting a three sisters garden in your own backyard is a great way to start a discussion about our responsibility to the land, and an introduction to the Native concept that while one can roam the land, one cannot own it. Buffalo, or bison, meat was the staple of the Plains Indian diet, and because it’s lower in fat and cholesterol than beef, it’s back in style. Want to feed your little one a burger fit for a warrior? Buffalo meat is available in most large groceries. Keep the patty thick, cook it over medium heat and don’t press the top - the meat is so lean that it cooks faster than beef and will dry out easily. Serve with dried wild berries. If you want to get a glimpse of living history, find a powwow through Native Net (www.nativeweb.org/resources). If you’re lucky, you’ll see dancers in full regalia, hear drumming and chanting, and see people waving smudge sticks, or smoke, through the air. Remember that this is a sacred religious event and act accordingly. Do you live in Miami, Topeka or Manhattan? Take a trip to the library and find out the Native American meaning of your city’s name. Or check it out on Wikipedia. Still stuck for ideas? Visit a museum like the landmark Museum of the American Indian in Washington D.C. or a memorial like Crazy Horse in South Dakota's Black Hills. Or try something closer to home. Play a game of lacrosse, which originated here more than 500 years ago. 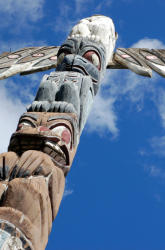 Find books of American Indian history and poetry. String beads. Walk through the woods and imagine how they looked before the arrival of European settlers, metal, and horses. Our Native heritage is all around us; enjoy it!